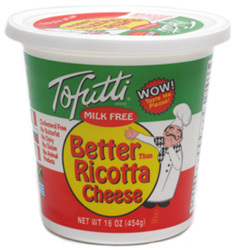 It’s finally here, the first vegan ricotta cheese alternative, crafted by the wizards of dairy alternatives at Tofutti! Now you can make your favorite Italian dishes with the perfect dairy-free replacement – you’ll be able to create spectacular pastas, pizzas, calzones, lasagna, ravioli, cannoli and more with this handy tofu-based ricotta. It’s also gluten-free, too! 16 oz. (454g) container is $6.19. From Anonymous of Loma Linda, California on 2/20/2019 . The texture is great: creamy, slighty gritty/crumbly like ricotta. Right out of the container, it’s got a slightly sweet flavor. But nobody eats ricotta cheese straight out of the container, so I decided to give it a try in a recipe. I added unsweetened almond milk, garlic, lemon, and salt & pepper to make a sauce for some pasta. The weird taste overpowered all of that. I don’t know how to describe it, but it’s got it’s own flavor that will probably overpower anything you cook it with. I won’t be buying it again. From Anonymous of Baldwin, New York on 2/11/2019 . This stuff is DISGUSTING. I tried to make stuffed shells. I tasted it in the container and was turned off, but added a ton of basil, garlic, onion, oregano, etc. to try to save it. Nope. Didn’t work at all, it overpowered all of that. It is very sweet tasting? And tastes like chemicals.. it might be good for baking. Tried this to make a spinach lasagna. I mixed it with a vegan shredded mozarella and fresh parsley and lots of garlic. I used this delicious concoction for 2 of my lasagna layers. My omnivore BF still dreams about that lasagna. Mind you, a spoonful of it out of the tub is not so good but neither (IMO) is the shredded vegan cheeses. Many of these faux dairy cheeses must be melted. So grateful this product exists! From Anonymous of Marlton , New Jersey on 1/17/2017 . From Anonymous of Tempe, Arizona on 12/18/2016 . I made 2 recipes with this. It was decent in a spanakopita recipe as it wasn't central to the recipe. Then I made stuffed shells and I am trying to come up with a way to save the batch. The filling is SO gross. I used the Tofutti ricotta, Follow Your Heart parm and mozz among seasonings and egg replacer... The Tofutti overpowers the filling and it's just got a very weird and overly creamy sticky texture. It's really disgusting. Next time I'll stick to making my own ricotta from tofu - which is cheaper too. Allergens This item is manufactured in a facility that also processes soy.